Large display screen, 70 oz huge water reservoir and bold looks is what that defines the Keurig K475 2.0 Brewer. This model came up after the discontinuation of Keurig K450 which was rather built for exclusive use of pods made by Green Mountain only. With the introduction of Keurig 2.0 technology, the machines were not compatible with the older reusable K-cups. The machines only accepted pods made and licensed by Green Mountain and that stopped users from using the older or unlicensed pods. This step was not in favor of it’s loyal customers and so, the company saw drop in sales by 23 percent. The brand lately thought that they are not going the legit way and so, they introduced a new series of coffee makers including Keurig K475, which is now compatible with the older K-cups too. Keurig, as we all know is a leading brand in manufacturing Single Serve Machines and can be easily found in many kitchen counters all over. If you are searching for a one cup coffee maker, K475 is a great pick. It is a new product but is already popular in it’s category. Below, we have done a complete review of K475 which will probably help you discover it’s overall potential. Inheriting the same look of the Keurig default look, this machine is a little bold with large LCD screen, biggi reservoir and a descent silver ascents. K475 is a little taller than it’s siblings and spans a shorter length on the platform, hence saves some space. Additionally, this piece utilises technology to identify the inserted pod and optimises brewing. You can also make iced beverages with this Keurig. Heating up of water is a SCORE in this coffee maker and it does this thing quickly, so you don’t have to wander around to do other things. The most important aspect of any coffee maker is their overall performance and the output it delivers. It’s one of the easiest machine on the planet to brew coffee at home. Moreover, the large screen guides about everything you want to do. People have used it for years and are yet satisfied with it since it still produces the same beverages as it does at the start. As a result, the coffee produced is literally hot and perfectly brewed (as compared with the same category products). The K475 Keurig is equipped with a low noise motor lets the machine not sound weird while functioning, like K145 OfficePRO does. The latter has a heavy duty motor that is made to last long since it is being a target for offices where use is recurrent and fast. K475 is targeted for home use and hence, the parts used are quite feasible for that. If you are a coffeeholic and make about 15-20 cups a day, we would rather suggest to go with Keurig K145 as it’s sturdier built for heavy use. 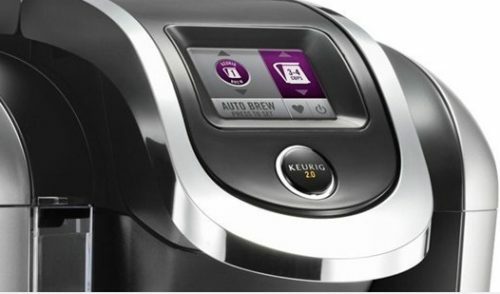 The Keurig K475 is a great choice for a small family who loves to drink coffee in a general way much as every home does. It’s well built, bold and looks good. It’s not for coffeeholics rather it is for coffee loving people. Also, it is a little tall than others so check the place where you are going to place it as the height can be a problem. Moreover, the price part comes under the the $200 tag and it is included in our list of K-Cup Coffee Makers. One similar option is Keurig K575 which boasts of more larger 80oz water tank and big LCD display. Overall, the K475 Keurig is a great machine for beginners or intermediates who don’t have much time to brew, desire a good tasting coffee and can afford the Pods too. Keurig K 475 is an amazing product by the brand and has already been doing amazing in the market from long. It has all the required features, looks good and the built quality is great too.